It is customary in many countries to watch WWII movies during the first week of May, thus commemorating the atrocities that took place now over 70 years ago. In those movies, the tragedy is kept alive, being brought on screens – to preserve the memories, to remind of the warnings, to hope that the same never happens again. 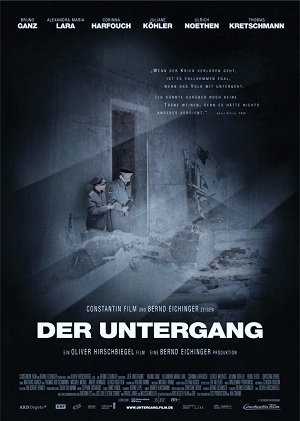 In 2004, Germany produced DOWNFALL (Der Untergang), focusing on the life of a young woman who becomes Hitler’s secretary not long before Berlin is taken by the Russian Army. The film is made in the best story telling tradition, with a typical and recognizable German attention to detail. Some scenes are artistically over-dramatized, to enhance the impact the tragedy had on people involved in it, and their descendants. Not an easy task, perhaps, but Germany did it again, and did it well. Is it the need to rehabilitate itself that drives German cinematography to the highest production quality when it comes to a WWII movie? Whatever the reason, due diligence was done in creating historically accurate and believable characters, and emotionally honest scenes that sort of imprint, visually, the statements of truth. A special comment needs to be made on the brilliant performance of Bruno Ganz in the role of Adolf Hitler. Playing one of the most complex and dark villains in human history is not a walk in a park. Certainly, Bruno Ganz did well in studying his role and making sure the image he created is not stereotypical, but very much correct, exact to the point of body language and Hitler’s nervous tics. That is a very scary thing to do for a film actor – getting under the skin of such an evil figure, penetrating inside his mind, staying in this dark character for the duration of production, living with the after-taste. Undoubtedly, Ganz succeeded in bringing Hitler from the past closer to us today – and in that, there’s a certain element of horror, subtle, perhaps not immediately recognized, but apparent after a moment of contemplation. What we, normal people, like to believe, is that evil is not natural, not human and must, therefore, be explained by some sort of anomaly, disease, mental condition…. How many biographers dissected Hitler’s personality? How much literature has been written on his personalia? Well, that all becomes irrelevant when a living, breathing tirant is addressing the audience, comfortably sitting in soft chairs of cinema theaters. Bruno Ganz’s performance made a very powerful point – Hitler was a human being, sane and smart and if not for his monstrous side, he could have been a next door neighbor. Humanity shows in his patient attitude, his caring smile, his compassionate speech…. Only we know that that is the most incredible of lies. Realization that Hitler is one of us is definitely the toughest truth anyone could ever want to deal with. DOWNFALL is also built on dialogues with evergreen and characteristic statements, designed to make us think, analyze, go deeper into the human soul. 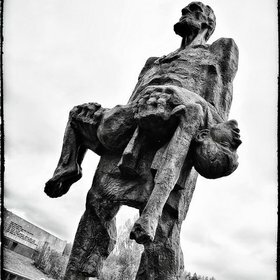 WWII is the ugliest of all human tragedies, it still affects generations, and its impact is still felt worldwide. When the film’s main character leaves falling Berlin behind, she does not depart empty handed – with her, she takes the emotional trauma of her nation, memories that will haunt her and pain that will trouble her for decades after. We’re still dealing with consequences of WWII, with mysteries and cover-ups, seeking absolution and redemption, but the resolution has yet to come. From the first pages of this book you find yourself in Berlin in the middle of the World War II, looking through the eyes of a child, and seeing things that don’t seem to have any logic in them. You are five years old, and things are rough because your country is under an obsessive tyranny of a paranoid, mad and evil man of whom you know only what is allowed to be said in public. Your nation is suffering from a propaganda machine and you, as a little girl, do not escape the trauma. And yet, you also notice things that make you wonder what exactly is going on. You feel that something else is transpiring. Only, as a child, you can’t be told. And you know, somewhere in your heart, not to ask. Ilka’s language is laconic and vividly descriptive. She gives names to things that the little girl experiences in the years from 1940 till 1948, things that do not make sense to her at all. At times, she acts on innocent impulses. Once, on a bus, she sees an old couple. She doesn’t know they are Jewish, but she wants to have same big yellow stars that she sees on their sleeves. Her mother is there to gag her before she alarms other passengers. Her mother is terrified. Juvenile bunker in the book is a place where German children were taken every once in a while at night, for their protection from regular bombardments. It very much reminds a boot camp. Ilka and her family flee Berlin to the country, to her grandparents. There, the children are sheltered along with other refugees, but they also hear the war’s echo and live through poverty, disease, hunger, their mother’s near insanity and many dangers and losses. If you ever wondered what it was like for German children and their families under the Nazi rule, this book is for you. In it you will find details that complete the picture and make you see that other side. These details, rendered through a child’s perception, will remind you of what you as an adult know about that war and often this reminder will be shocking. The little girl in the book is an insider witness to the war. Because of her innocence, her narration is not contaminated with pre-conceived ideas. 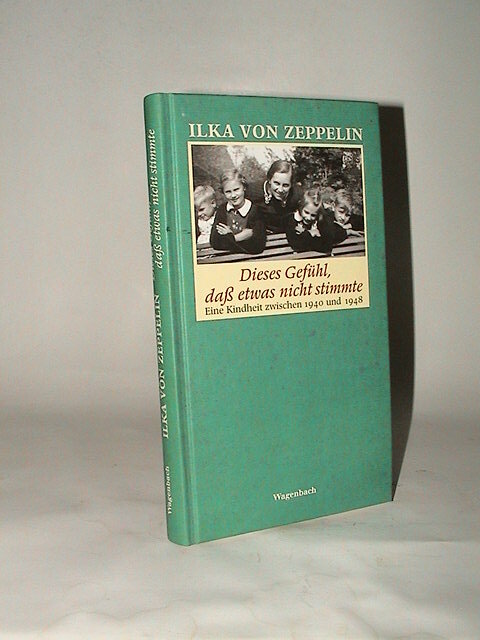 Ilka von Zeppelin made her professional career in psychology and wrote a number of books on the subject, and she waited 60 years to tell her own story. If you read in German or Dutch, this book is available under the following titles: Dieses Gefühl, daß etwas nicht stimmte (Ger. ), Het gevoel dat er iets niet klopte (Ned.) and let us hope the English translation will follow soon, along with others. The memories in this book are worth being shared with the entire world.